You don’t need to live in a cool climate to enjoy the lightweight luxury of PAZ Collective’s artisanal wool and silk Indian scarves. 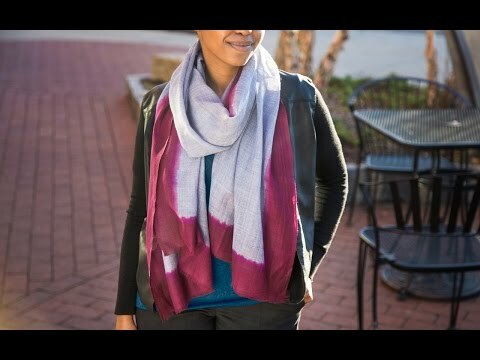 Woven and dyed by hand, these unique scarves are versatile, and—because they’re mainly wool—wrinkle-resistant. You’ll want to take them along in your travels. Founder Judy Ganeles is herself a world traveler, working with artisans around the globe for years. She started in Mexico, where local workers craft one-of-a-kind sterling silver jewelry. Recently, Judy added textiles to her collection, drawing on the skills and culture of India. Thanks to the generous size, you can wear these all-season scarves around your neck or shoulders. Like all handmade textiles, they have slight variations that give the designs character and make each one-of-a-kind. PAZ Collective is committed to respecting the traditions and well-being of its artisans. So every all-season scarf is made following Fair Trade principles. 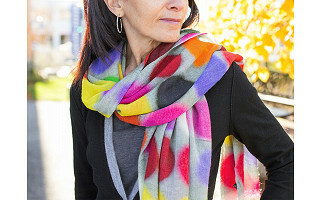 You’ll feel as good supporting those artisans as you’ll look in one of their scarves. Hello everyone, my name is Lydia. I am the Vice President and Director of Textiles at PAZ Collective and I work closely with the founder, Judy Ganeles. I personally design, source and oversee production in India for all of PAZ Collective ’s scarves. I’m so excited to introduce PAZ Collective to you and I welcome all of your questions! It mentions silk and wool scarves, but nothing is said what these that are options are made of? Hi. It looks like there are raw hems on the shorter ends. How are the sides finished -- are they hand rolled? Pretty, btw! Hi Dee, that is a sharp eye! The sides are unfinished which gives each a unique look. Thanks for the kind words! @a Since the edges are unfinished, and washing it will it the ends shred and the fibers will come loose as I have some scarves that do come loose. Also since it is wool most of the material, will one feel itchie on the neck skin when worn in all weather? Thank you for your question. The scarves are a blend of silk and fine wool. The silk helps soften the wool, eliminating the itchy feeling. We recommend dry cleaning your scarves. Hi Dee and A, I'm the person in the video. I just confirmed that the long edges of the scarves are selvedge edges so they are not going to unravel. The fine fringe at the short ends is secure as it a very fine yarn in a tight weave. You'd have to really pick at the fibers to start them coming loose at the fringe edges. And I can confirm the lack of itch--I am sensitive to that too and would not have enjoyed testing/wearing the scarves if they itched. @Jules I have the seeing spots scarf and am rough on my clothes. The edge long selvage edges are are secure and the shorter fringe stay tight. I love the soft feel of this light scarf that keeps me warm. I'm wearing today in 33 degree weather and feel very comforted and comfortable in it. No itching at all. Are these the only two designs being offered? When will there be more of a selection? Hi Rona, at this time, we just have the Rothko and Seeing Spots design, but may look to expand the selection with enough interest. 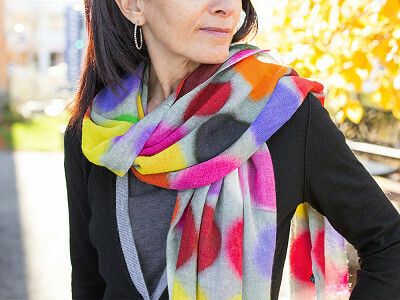 The Rothko scarf does come in a few different colors! These scarves are fantastic!!! Not only are they beautiful, the fabrics are wonderful to wear!! I love them! Thanks for the compliments. We are all fans of these pieces as well and get compliments whenever we wear them. I'm sure you will too. We are looking into it now, Erin! Stay tuned! Hi Erin, the Seeing Spots scarf is (unsurprisingly) sold out! There is a bug we are fixing now so you should soon be able to submit to be notified we get them back in stock! Thank you! Btw, the other one works fine. Glad to hear it, Erin! Thanks for letting us know! Is the sunrise color more like a maroon/burgundy, brownish/brick red, or orange-red; it looks different in different pictures. Hi Mel, it is more like like a maroon/burgundy! You don’t need to live in a cool climate to enjoy the lightweight luxury of PAZ Collective’s artisanal wool and silk Indian scarves. 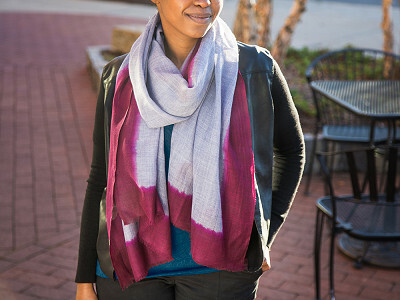 Woven and dyed by hand, these unique scarves are versatile, and—because they’re mainly wool—wrinkle-resistant. You’ll want to take them along in your travels. Founder Judy Ganeles is herself a world traveler, working with artisans around the globe for years. She started in Mexico, where local workers craft one-of-a-kind sterling silver jewelry. Recently, Judy added textiles to her collection, drawing on the skills and culture of India. Thanks to the generous size, you can wear these all-season scarves around your neck or shoulders. Like all handmade textiles, they have slight variations that give the designs character and make each one-of-a-kind.